Nothing starts your day better than real oatmeal – especially on a cold day! 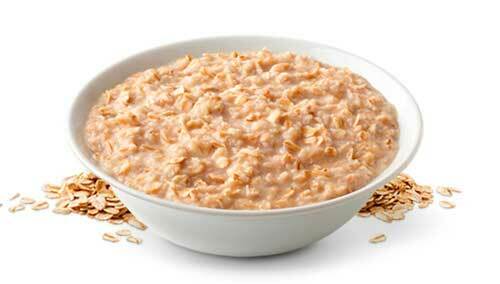 Most varieties of instant oatmeal are packed full of sugar and other added nastiness so please avoid these. Instead, make real oatmeal. The problem is, making real oatmeal takes time and, to make matters worse, you have to stand over it and stir it or it will burn. I don’t know about you but I don’t always have 15-minutes spare in the morning to do this. However, with this recipe, your oatmeal is ready in minutes so you can eat and go much more quickly. Having your oatmeal without sugar or syrup might seem odd at first but after a couple of tries, you’ll start to notice that oatmeal is actually naturally sweet and you really don’t need to add any sweetener at all. The addition of cinnamon makes oatmeal not only taste amazing but also increases your sensitivity to insulin which will help control your blood sugar. This is a high carb breakfast and is ideal for the days you are going to be very active and although it contains sugar, none of the sugar is added – it’s all naturally occurring in the oats and the milk. Note: Looking for a low sugar recipe cookbook ? I recommend you to have a look at The 21 day Sugar Detox by Diane Sanfilippo. More than an hundred recipes, a meal planner and a complete plan to help you to get rid of sugar. My review and the contents of the book here. Place the oatmeal and the milk in a bowl and mix thoroughly. Place in the fridge overnight. This softens the oatmeal and saves you having to cook it for a long time in the morning. When you are ready to eat, pour the mixture into a non-stick pan and heat for 3-5 minutes. Put the heated oatmeal into a bowl and sprinkle with cinnamon. You can also put the oatmeal in a microwave and blast it for 60-seconds instead. Reduce the calorie content of this breakfast by using half water/half milk or all water but this will make the oatmeal taste much less creamy. For a more decadent breakfast, stir in a tablespoon of heavy cream before eating. Are the recipes the only food for each meal? Could you put fruit on the oatmeal? What do you eat the guacamole with? All recipes sound good but some don’t make a complete meal (in my mind). I always add fruit to mostly everything I eat. Fruit contains a lot of fiber and is the perfect way to hydrate our body. Fruit contains sugar but it’s a totally different chemical composition of the artificially added sugar, so you don’t have to worry about fruit. Eat as much fruit as you desire. More about added vs natural sugar here.